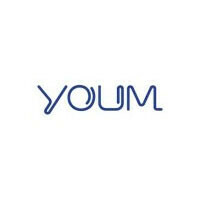 Samsung recently filed for a trademark on “YOUM” and has now updated its website referring to its flexible AMOLED technology as YOUM. Samsung also filed for trademarks on WAMOLED, FAMOLED, PAMOLED, and TAMOLED. While we’re sure the “unbreakable” part could probably be challenged, it is still a product that will be very interesting see come to market. Now that Samsung has finally named its creation, we hope that it is close to integrating YOUM into some upcoming gadgets. talk about burning your eyes off... they would be constantly focusing on something that close which would strain them and make for a horrible experience if worn for long durations... idk what the googlasses do but they dont have a screen and what is the point of flexible displays for smartphones? i know for a lot of other stuff its great.. but i dont want my phone bending all the time.. 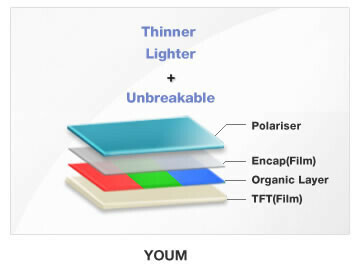 The whole point of flexible AMOLEDS is not bendable screens but thinner, lighter and more durable OLED screens!! As these screens dont use the traditional glass substrates they can be made more thinner with polymer substrates. ofcourse you get an additional benefit of flexibility but thats not the reason behind the research of these flexible OLEDs. Billboard things on objects? That would be so futuristic man! But do you remember the "chameleon phone" project? Where the phone's body changes color and matches it's surroundings? I think they can also use the glass for the body and they'll have the entire phone as a screen (there still should be a main screen though). That way it would trully b a chameleon phone! Speaking of flexibility of screens. Probably no more worries of phone in back pocket when seating. YES YES OH GOD IN HEAVEN YES, GIMMIE MY FLEXIBLE GALAXY S IV!!! wheb it comes to display tech no one is close to Samsung .. the only way the competition keeps up is through espionage. AMAZING Looking forward to this!